Zoey is currently Head of Customer Category at Carlton United Breweries, she has recently moved into this role which heads up the category development and customer marketing for CUB with the Coles Liquor Group. She joined CUB in 2013 and has held roles in both brand marketing and category development. 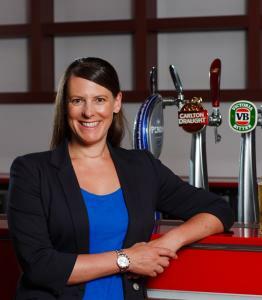 Whilst in category development she managed the category marketing for CUBs largest brands: Victoria Bitter, Carlton Draught and Carlton Mid. In this role she bought to market a major through the line campaign where both AFL and NRL sponsorships powerfully combined with CUBs’ 5 largest brands to deliver a season long beer and cider rewards program. Whilst in brand marketing at CUB Zoey managed the CUB mid strength portfolio, developing the first, national, naming rights sponsorship for Carlton Mid – ODI cricket and re-launching Carlton Cold. Prior to this Zoey worked at Fonterra Brands Australia in a Brand Development role for the yoghurt and dairy desserts category. From this role she drove brand and category growth with the existing Nestle dairy portfolio as well as a number of new to market innovations. Zoey began her career with Gillette Group UK working on the Oral-B brand before moving to Gillette Australia where she manage the flagship Gillette brand. From this role she worked across both global and local sponsorships, PR and communications campaigns such as David Beckham, World Cup and Grand Prix.